For a marketer the value created from making and selling a product is revenue (function of price) less costs. As long as this is profit it makes sense to serve the customers at the price. But let us put these two together. 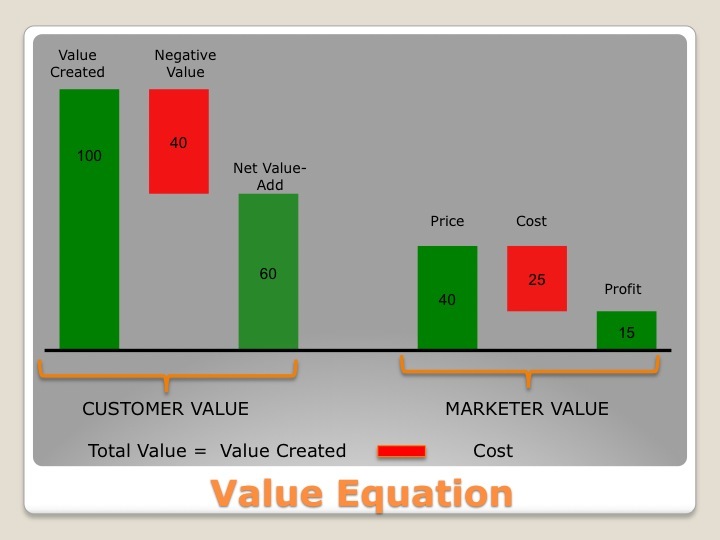 The total value of the customer and marketer is = Customer Value + Marketer Value. This is the size of the pie. Surprising to see price not being part of the total value equation? This does not mean price is irrelevant, it is the line that determines marketer’s share of the value created. While price is important in customer’s decision making and marketer’s profitability, it is irrelevant to total value maximization. To maximize total value you either increase total value created or aggressively drive down costs. A moment’s reflection will convince you that both these levers are under the control of the marketer. Bigger the pie, bigger is the share of marketer even at current proportional division. This leads us to define the role of innovation. A marketer’s efforts are better spent not on pricing innovations but on innovations that drive up value for their customers and innovations that drive out costs from their operations. What is your value equation? How do you define your innovation?